Overlapping door: multiple panels, articulated juncture, vertical lifting and panels gather under the floor or on top, maximum use of portal space; Hydraulic door: hydraulic drive single panel to the roof level; Bi-folding door:　Consist of upper panel, lower panel, track, lifting system, sealing system and safety device; door operator is installed on lower panel; electric motor rotates the rolling block and change the length of lifting belt or steel wire, to realize door opening and closing. 1. Steel structure as framework, general selection is Q235. inside can be filled with heat insulation material, heat and sound insulation are good. 2. Maximum measurement:width is according to user requirements. 4. Installing a fall protection components. 6. Motors and reducer: Domestic and imported motors are optional. 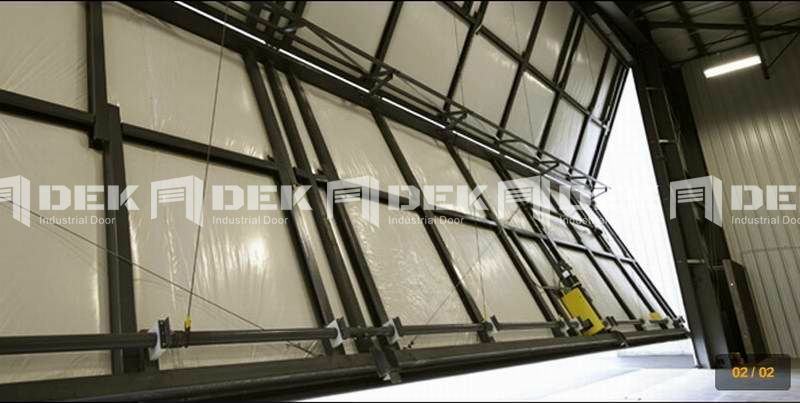 Vertical bi-folding door can be applied to long-span opening, especially those with no extra space on both side, which widely used for small hangar, garage, restaurant and other long-span openings.